Two friends, in their search for financial freedom, start a "business." What they didn't know was that they didn't know anything about business. After placing an ad in the paper,the two hit the streets with a yellow banner and unshakeable optimism. 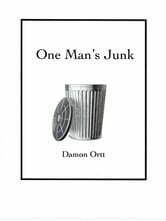 This is a hilarious short story of a short-lived business, and the exploits of two men who will do anything for a buck. Sadly, this is a true story. It Was Never About the Ketchup! For the Love of God! A memoir of Army Basic Training?